Doug Phillips and 40 other sausage super fans get free encased meat for life. Doug Phillips The most intriguing offer from beloved Roscoe Village encased-meat emporium Hot Doug’s isn’t one of its exotic “Game of the Week” menu specials. 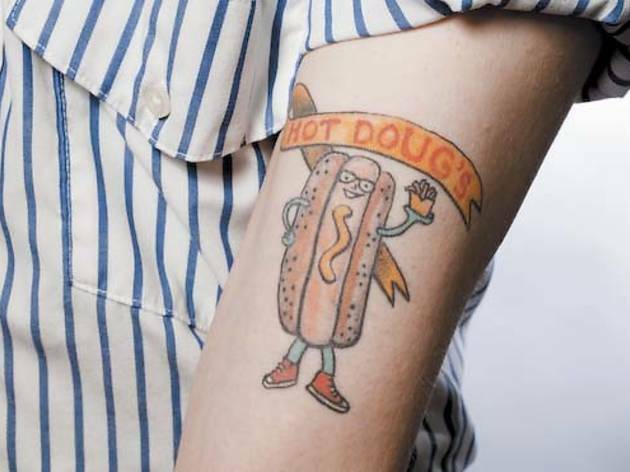 It’s an unwritten promise from sausage-slinging seigneur Doug Sohn that anyone who gets a tattoo of the restaurant’s logo earns free Hot Doug’s dogs for life. (Or at least as long as Sohn is still kicking.) Phillips is one of nearly 40 super fans who have the smiling, sneaker-wearing red hot indelibly inked on their bodies. Boozing at Kuma’s in November, the 24-year-old Boiler Room bartender and Scofflaw bar back decided to make it his first piece after spotting a picture on the burger joint’s wall of something arguably crazier: a guy with a giant hamburger tat on his foot. 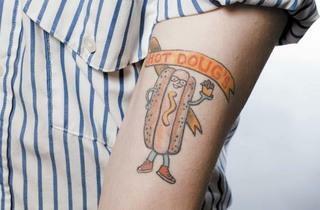 The day after sitting for the tattoo, Phillips went to claim his first free meal. When he told Sohn his first name, Sohn laughed. “He said, ‘Well, that’s your reason,’ ” Phillips recalls. “ ‘Now what’s the reason for the 30-some other people who have the tattoo?’ ” Alas, Phillips still isn’t authorized to cut Hot Doug’s notoriously long line.